Applied load and the Dimmer 2 itself may be damaged if the applied load is inconsistent with the technical specifications! Some types of the LED bulbs and compact fluorescent lamps are designed to work in leading edge operating mode. FIBARO Dimmer 2 supports only compact fluorescent tube lamps and fluorescent tube lamps with electronic ballast. Do not connect other types of fluorescent lamps! Connecting the FIBARO Dimmer 2 in a manner inconsistent with manual may cause risk to health, life or material damage. Connect with one of the diagrams below. It is not recommended to install different types of wall switches (momentary, toggle, etc.) in a 3-way connection. While adding the Dimmer 2 to the network with connected toggle switch, ensure that all switch contact is open (off). Otherwise it will prevent adding/removing the device to/from the network. For toggle switches in default configuration perform six position changes. In case of problems related to unknown configuration or type of external switch use the B-button to add/remove. Removing the Dimmer 2 from the Z-Wave network restores all the default parameters of the device, but does not reset power metering data. FIBARO Dimmer 2 has a built-in Z-Wave network main controller’s range tester. Visual indicator pulsing green – Dimmer 2 attempts to establish a direct communication with the main controller. If a direct communication attempt fails, the device will try to establish a routed communication, through other modules, which will be signalled by visual indicator pulsing yellow. 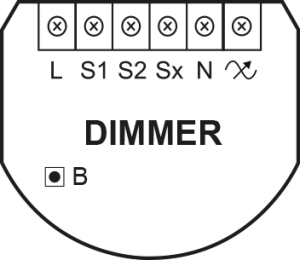 Visual indicator glowing green – Dimmer 2 communicates with the main controller directly. Visual indicator pulsing yellow – Dimmer 2 tries to establish a routed communication with the main controller through other modules (repeaters). Visual indicator glowing yellow – Dimmer 2 communicates with the main controller through the other modules. After 2 seconds the device will retry to establish a direct communication with the main controller, which will be signalled with visual indicator pulsing green. Visual indicator pulsing violet – Dimmer 2 does communicate at the maximum distance of the Z-Wave network. If connection proves successful it will be confirmed with a yellow glow. It’s not recommended to use the device at the range limit. Visual indicator glowing red – Dimmer 2 is not able to connect to the main controller directly or through another Z-Wave network device (repeater). 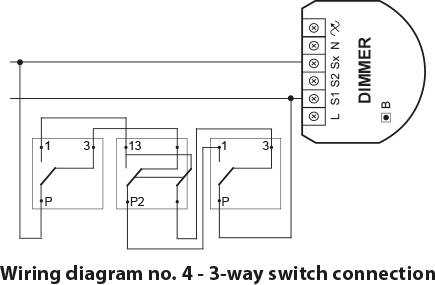 Communication mode of the Dimmer 2 may switch between direct and one using routing, especially if the device is on the limit of the direct range. The device will not respond to ALL ON/ALL OFF commands if added in secure mode. The Dimmer 2 responds to commands ALL ON/ALL OFF that may be sent by the Z-Wave controller. ALL ON/ALL OFF commands are usually implemented in the remote controllers using Z-wave protocol, and they are used to issue commands directed to the entire system. By default, both commands ALL ON and ALL OFF are accepted. Settings may be changed by modifying the value of parameter 11. In this way the user may determine to which commands the device should respond. Turning the light ON/OFF: change the position of switch no. 1. The Dimmer 2 will be activated always at previously set brightness level. Brightening/dimming the light: hold switch no. 1 down. When the switch is held down, the Dimmer 2 will always reach the extreme value of 1% or 99%. Turning the light ON completely: fast double-click switch no. 1. The Dimmer 2 will set the load at 99%. Turning the light ON/OFF: toggle switch no. 1. The Dimmer 2 will be activated always at previously set brightness level. Turning the light ON completely: toggle twice switch no. 1. The Dimmer 2 will set the load at 99%. FIBARO Dimmer 2 has a MENU with each position indicated by the specified LED indicator colour. Dimmer 2 is equipped with an algorithm of smart light source detection. Depending on the connected type of light source, it automatically adjusts an optimal control mode (leading edge for inductive loads, trailing edge for capacitive or resistive loads). The procedure of learning the light source type is called calibration. During the calibration procedure, radio connection is disabled and the Dimmer 2 does not respond to any commands. It may cause temporary problems with communication in the Z-Wave network. After completing the calibration, communication with the module will be restored. Calibration automatically adjusts maximum and minimum light levels (parameter 1 and 2). However, the installer is obliged to verify the proper operation of the device, according to control modes description. There is a 10% probability that calibration settings will require a manual correction. In a 2-wire connection for loads other than resistive parameter 1 settings must be adjusted manually. Calibration procedure is performed always after removing the device from the Z-Wave network. If the device is not included, after each power on/off calibration will occur. For the included device, calibration is performed in accordance with the parameter 35 settings. Some types of LED and CF lamps are designed to operate in leading edge mode (with conventional dimmers). Information about proper operation mode of the bulb should be included in its manual. In this case you have to manually force the desired operating mode using parameter 30. After changing the load launch the calibration or remove and add the device. Before changing the operating mode or performing the calibration procedure the light must be turned off. Verify the operating mode, according to product documentation. By default, calibration is performed without FIBARO Bypass 2. In case of connecting the Bypass 2, it is required to force the appropriate calibration procedure using B-button menu or through parameter 13. The device saves the last calibration enforcement mode (with or without Bypass 2). GREEN – Light source recognized as dimmable, dimming levels set, brightness may be controlled using the S1 switch. YELLOW – Light source recognized as non-dimmable, possibility to turn ON/OFF connected light with default parameters settings. RED – Calibration procedure failed. Possible reasons: lack of connected load or connected light source exceeds maximum power, which may be controlled by the Dimmer 2. BLINKING RED – Calibration procedure failed. Possible reasons: installation failure or damaged load (causing activation of the overcurrent protection). Dimming/brightening is performed by moving the slider. The current status of the Dimmer 2 is shown on the bar indicator. Turning the device ON/OFF – ON and OFF icons are used for setting the last saved state or turning off the Dimmer 2. FIBARO Dimmer 2 allows for the active power and energy consumption monitoring. Data is sent to the main Z-Wave controller, e.g. Home Center. Measuring is carried out by the most advanced micro-controller technology, assuring maximum accuracy and precision. FIBARO Dimmer 2 in the 3-wire connection has the power and energy measurement function. In case of the 2-wire connection this function is available only for load of cosφ ≥ 0.99. In other cases power is estimated and can differ from actual power consumed by the device. FIBARO Dimmer 2 stores periodically (every 5 minutes) the consumption data in the device memory. Disconnecting the module from the power supply will not erase the energy consumption data. By resetting the device (see „Operating the device” on page 12). * Measurements in this case are only illustrative, returned values may differ from the actual measurement. In the case of reporting incorrect values change the values of parameters 58 and 59. Power measurement in the 2-wire connection does not include mains voltage fluctuations within +/- 10%. Alarm data-frames are sent by devices that are system sensors (e.g., flood sensors, smoke detectors, motion detectors, etc.). Events result from installation flaws, faulty light source operation or incorrect manual changes in advanced configuration. The device may stop responding to user’s commands and actions, leaving the light source off. Message with information about the type of error is sent by default (using Z-Wave network). Pressing any of the connected switches or changing state of the device using the controller will exit error mode. Dimmer 2 features self-temperature measurement function. In case of reaching critical temperature, the load is turned off and the gateway receives an information about exceeding maximum temperature of the module. Dimmer 2 is equipped with functionality of detecting the burnt out bulb. In case of such situation, Dimmer 2 sends the notification about load failure. Described function is not available for values of parameter 58 different than 0. Power variation is detected in accordance with the settings of parameters 15 and 16. Parameter 15 set to 30%. Parameter 16 set to 5 seconds. Dimmer 2 will detect the change of load at the moment of power variation by 30% compared to standard power consumption (measured during the calibration) and after 5 seconds from brightness level stabilization. This function is available only in a control mode compliant with the mode recognized during the calibration (parameter 14 set to 1). Appearing of an error may be the result of not connecting the load. It may suggest burning out all of the loads connected to the Dimmer 2. Damaged load should be immediately replaced. After connecting the new load, FIBARO Dimmer 2 will return to normal operation. Appearing of an error may be the result of electrical surges, incorrect load control (inductive load controlled in trailing edge mode) or connecting the prohibited type of load. Appearing of an error may also be the result of rapid powering on the load. It may also occur if the soft-start functionality is disabled (parameter 34 set to 0) or as a result of the short circuit. If parameter 37 is set to 1, the device will automatically try to turn on again. If described error has been caused by the rapid powering on the load, then FIBARO Dimmer 2 will return to normal operation after reenabling. After three unsuccessful automatic tries of turning on the load, Dimmer 2 will stay in OVERCURRENT error mode (module turned off). In such situation, it is required to remove the failure (possible short circuit in the installation.) Otherwise, it is recommended to set the long soft-start (parameter 34 set to 2). Appearing of an error is a result of connecting receivers with too much power consumption. In this case FIBARO Dimmer 2 will automatically turn off the lighting. It is required to reduce power consumption of connected load (e.g. by reducing the number of receivers) and turn on the light source again by the wall switch or a Z-Wave command. Appearing of an error in a 2-wire connection may be the result of mains voltage drop or a too high brightness level of the light source. Voltage drop error suggests that parameter 2 value should be reduced until disappearing of the failure. You can also recalibrate the load using parameter 13. After three unsuccessful automatic tries of turning on the load, Dimmer 2 will stay in VOLTAGE DROP error mode (module turned off). Appearing of an error may be a result of serious hardware failure of the Dimmer 2. In this case the Dimmer 2 sets the maximum brightness level and the LED visual indicator starts blinking in red. All external actions (Z-Wave commands, pressing the switches, menu settings) will be ignored. We recommend disconnecting the device from the power supply and contacting the customer service or to initiate the guarantee procedure. This error may also appear as a result of enabling the Dimmer 2 without load connected to the output in 3-wire connection. It is not a dangerous situation. We recommend disabling the fuse, connecting the load and enabling the fuse again. If parameter 35 is set to 3 or 4, the load will be calibrated again after turning on the load or an occurrence of LOAD ERROR, SURGE or OVERCURRENT error. 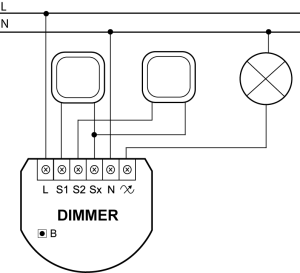 Dimmer 2 supports the operation of multichannel devices. Multichannel devices are devices that include two or more circuits inside one physical unit. 1st Association Group „Lifeline” reports state of the device. Main Z-Wave+ network controller should be added to this group. The „Lifeline” group can handle only one device. It is not recommended to modify this group. 2nd Association Group „On/Off (S1)” is assigned to switch no. 1. Sends BASIC command class frame according to the state of the device. 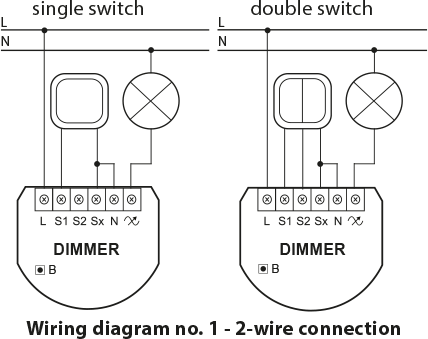 3rd Association Group „Dimmer (S1)” is assigned to switch no. 1. Sends MULTILEVEL SWITCH command class frame. Allows sending dim/brighten command to associated devices. 4th Association Group „On/Off (S2)” is assigned to switch no. 2. Sends BASIC command class frame according to the state of the device. 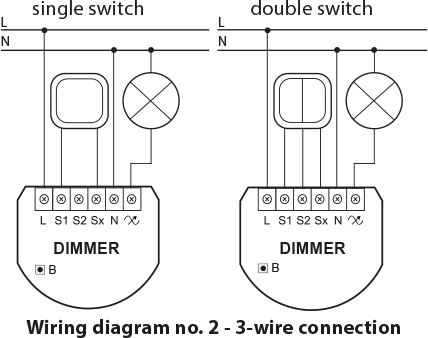 5th Association Group „Dimmer (S2)” is assigned to switch no. 2. Sends MULTILEVEL SWITCH command class frame. Allows sending dim/brighten command to associated devices. FIBARO Dimmer 2 allows for controlling 5 regular and 5 multichannel devices per an association group, out of which 1 field is reserved for the Z-Wave network main controller. FIBARO Dimmer 2 allows to customize its operation to user’s needs. The settings are available in the FIBARO interface as simple options that may be chosen by selecting the appropriate box. Parameter is set automatically during the calibration process, but can be changed manually after the calibration. The maximum brightness level (parameter 2) must be greater than the minimum brightness level (parameter 1). Virtual value set as a percentage level between parameters MIN (1%) and MAX. (99%). The Dimmer 2 will set to this value after first switch on. It is required for warming up and switching dimmable compact fluorescent lamps and certain types of light sources. 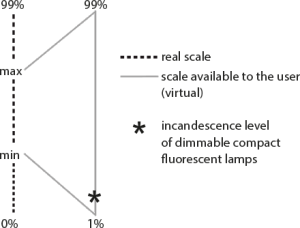 This parameter determines the time required for switching compact fluorescent lamps and certain types of light sources. Setting this parameter to 0 will disable the incandescence functionality. The Dimmer 2 will return to the last state before power failure. Changing value of this parameter will force the calibration process. During the calibration parameter is set to 1 or 2 and switched to 0 upon completion. This parameter determines operating mode of the Dimmer 2 (automatic/manual settings). Function based on the sudden power variation of a specific value, interpreted as a LOAD ERROR. Parameter 15 is relevant only when parameter 58 is set to 0 and the control mode is consistent with the mode set during the calibration process (parameter 30). 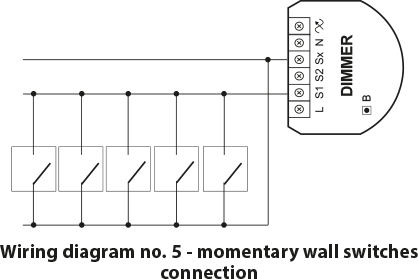 Time of delay (in seconds) for power variation detection, interpreted as a LOAD ERROR or OVERLOAD detection (too much power connected to the Dimmer 2). 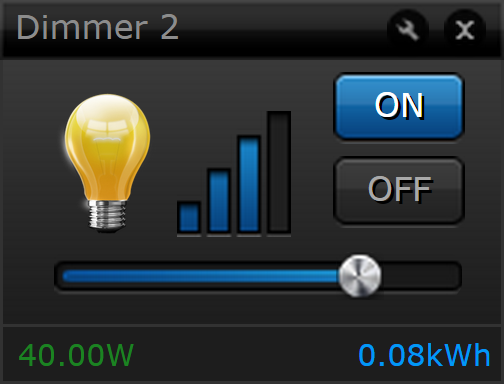 If the parameter is active, switching on the Dimmer 2 (S1 single click) will always set this brightness level. Choose between momentary, toggle and roller blind switch. Parameter determines, which actions will not result in sending frames to association groups. Parameter 24 values may be combined, e.g. 1+2=3 means that associations on switching ON or OFF the Dimmer 2 (single click) will not be sent. Parameter 25 values may be combined, e.g. 1+2=3 means that associations on switching ON or OFF the Dimmer 2 (single click) will not be sent. Switch no. 2 controls the Dimmer 2 additionally (in 3-way switch mode). Function disabled for parameter 20 set to 2 (roller blind switch). This parameter defines how commands are sent in specified association groups: as secure or non-secure. Parameter is active only in Z-Wave network security mode. It does not apply to 1st Lifeline group. Parameter 27 values may be combined, e.g. 1+2=3 means that 2nd & 3rd group are sent as secure. SCENE ID depends on the switch type configurations. Enabling scene activation functionality may cause slight delay in response to external switches and sending associations. 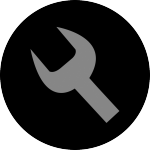 Modifications of parameters 30-39 should be performed only by a qualified installer. Forced auto-calibration will set this parameter’s value to 2. This mode is necessary while connecting non-dimmable light sources. Setting this parameter to 1 automatically ignores brightening/dimming time settings. Forced auto-calibration will set this parameter’s value to 2. Time required to warm up the filament of halogen bulb. This parameter determines the trigger of auto-calibration procedure, e.g. power on, load error, etc. Reaching the defined value will result in turning off the load. Additional apparent power limit of 350VA is active by default. Parameter 39 is relevant only when parameter 58 is set to 0. Alarm state may be cancelled earlier, as a result of pressing the switch or sending the Z-Wave command frame. The parameter defines the power level change that will result in a new power report being sent. The value is a percentage of the previous report. Parameter 52 defines a time period between consecutive reports. Timer is reset and counted from zero after each report. Energy level change which will result in sending a new energy report. The Dimmer 2 may include active power and energy consumed by itself in reports sent to the main controller. This parameter defines how to calculate active power. It is useful in a case of 2-wire connection with light sources other than resistive. Parameter 58 is set to 0 after forced auto-calibration. This parameter determines the approximate value of the power that will be reported by the device at its maximum brightness level. Available settings: 0-500 (0-500W) – power consumed by the load at the maximum brightness level. Parameter 59 works only when parameter 58 has a value other than 0. 1.What is a Dimmer 2 module? FIBARO Dimmer 2 is a device designed to control various types of light sources in 2 or 3-wire connection. It can switch or dim connected light source remotely using Z-Wave wireless protocol or through the wall switch connected directly to it. 2. How big load can be connected to the Dimmer 2? 3. What is association functionality? Association allows you to control two or more Z-Wave devices from one module. Association works always only from buttons (S1 and S2). 4. Is it possible to control two separated outputs from one Dimmer 2? 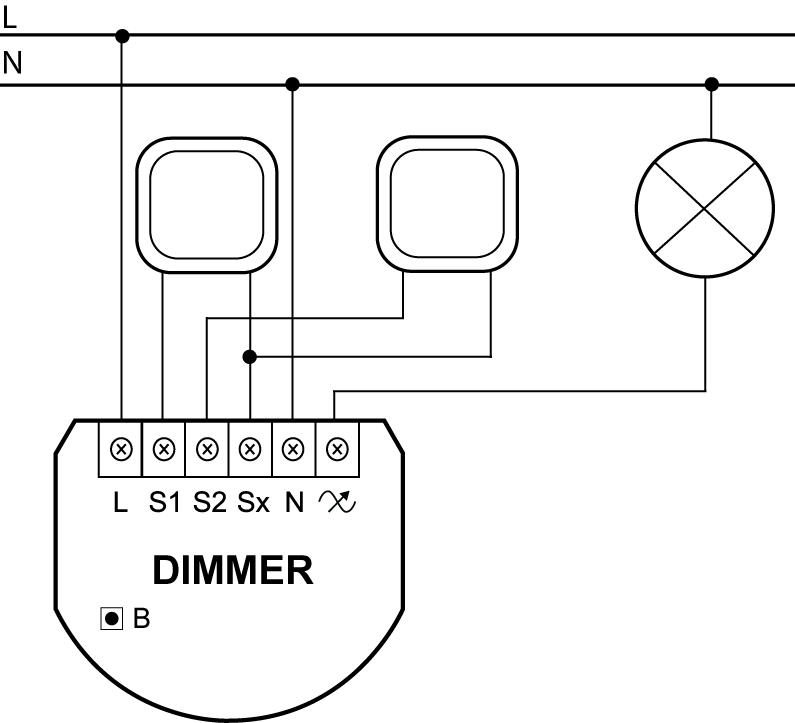 No – the Dimmer 2 has only one physical output (controlled from S1). To control two circuits you will need to connect another Dimmer. However there is possibility to control two or more Dimmers or Relay Switches from one module using association. 5. How can I use the S1 and the S2 connectors? Switch connected to the S1 terminal is a master switch. It activates the basic functionality of the Dimmer 2 (turning the light on/off, dimming) and starts the learning mode (Add/Remove). The switch connected to the S2 terminal is an optional switch and pushing it without changing the configuration parameters will not affect the status of the device. Functionality of the switches can be reversed by adjusting parameter 22. 6. What type of switches are compatible with the Dimmer 2? The Dimmer 2 is compatible with every switch. It can be both mono-stable (push button switch), bi-stable, or roller blind switch. 7. Where can I change switch type? You can modify it by changing parameter 20 value. 8. I have a light source that cannot be dimmed. Can I control it by the the Dimmer 2? What parameter should I modify? Yes – you can control such light and there is no need to change anything. The device will automatically recognize connected light source during the calibration procedure. 9. I have connected low power LED light to the Dimmer 2 and now I cannot turn it off completely. 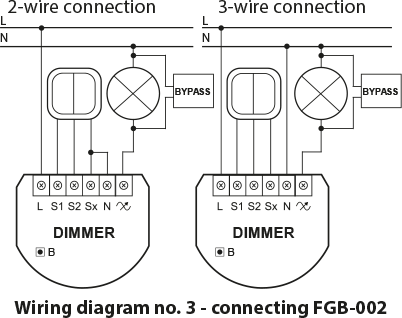 Please connect the separate Neutral wire to your Dimmer 2 (3-wire connection diagram) or use the Bypass 2 (FGB-002) module. 10. Connected low power LED is flickering all the time. What can I do? It’s recommended to use FIBARO Bypass 2 (FGB-002) module for low powered light sources, such as e.g. single 0.5 Watt LED. 11. Can I connect the Dimmer 2 to Halogen 12V GU10 bulbs with transformer? Yes, Dimmer 2 ensures high compatibility and may work with many types of light sources. 12. What kind of transformers are recommended for working with the Dimmer 2? You can use both electronic and ferromagnetic transformers. 13. What technology does your Dimmer 2 use? Is it leading edge or trailing edge? FIBARO Dimmer 2 automatically set the appropriate operating mode (leading edge/trailing edge) depending on the type of connected light source. 14. I want to connect the Dimmer 2 in 2-way connection (staircase wiring). How can I do it? 15. Can I use bi-stable switches in 2-way connection? Yes, you can use 2 bi-stable switches or any number of mono-stable switches. Only roller blind switches are not allowed in such configuration. 16. Connected light source flickers occasionally. How to avoid it? Occasional flickering of the lighting may be the result of ripple-control signals from the electricity supplier. The occurrence and magnitude of this effect depends on the country, region and time of the day. The effect is more frequent in 2-wire installation, on low dimming levels and with LED light sources. It is recommended to use 3-wire installation with conventional light sources (halogen, incandescent). 17. My lights tend to spontaneously change their light level in 2-wire installation. Some capacitive lights (e.g. dimmable LEDs) tend to flicker at certain levels in 2 wire connection. Dimmer 2 utilizes automatic detection of such event and corrects the light level to avoid the flickering. In countries using ripple-control, the correction may cause changes in brightness. In this case, it is necessary to disable the correction or adjust the time of correction for flickering loads by modifying the value of parameter 38 (parameter available only in firmware 3.5 or higher). Lights are blinking after connecting FIBARO Dimmer 2. Check the type of light connected to your FIBARO Dimmer 2. + If you are using LED light source, use FIBARO Bypass 2. I can’t set the FIBARO Dimmer 2 to value between 0% and 100%. Your lighting type is identified as not dimmerable. + Reconfigure the device. Login to Home Center 2/Lite, go to Devices, then Advanced and find the Reconfigure option. Change parameters of the device. + Change the value of parameter 20 (Type of switch) or 32 (On and off type). After a short period of working, light turns off. + Login to your Home Center Lite/2, go to device’s advanced settings and change the parameter 6 (Time of a dimming step at automatic control) to 0,03 s.
It turns on and off automatically. Surge Error occurs. + Change parameters 1 and 2 (maximum and minimum brightness level) and 34 (soft start) to 2 (turn on soft start).